The Desert Locust situation is improving along both sides of the Red Sea as a result of intensive control operations that treated more than 80 000 ha during March and due to drying conditions. Nevertheless, second-generation breeding is still in progress in some coastal areas of Sudan and Saudi Arabia where ecological conditions remain favourable, causing additional hopper and adult groups, bands and a few swarms to form. Some adult groups moved to the spring breeding areas in the interior of Saudi Arabia and laid eggs in March. In southwest Asia, adult groups and a few swarms are breeding on the southern coast of Iran and hatching commenced at the end of March. Adult groups and at least one swarm appeared in adjacent areas of southwest Pakistan in mid-March where they laid eggs. Control operations were in progress in both countries. During April, locust numbers will decline along both sides of the Red Sea but will increase in the spring breeding areas in the interior of Saudi Arabia, and coastal and interior areas of southern Iran and southwest Pakistan where hatching will occur and hopper groups and bands are expected to form. Some of these could eventually form adult groups and perhaps a few small swarms by late May. Adults groups may also appear in the Nile Valley in northern Sudan and breed near cropping areas. In northwest Africa, smaller-scale breeding will occur in areas south of the Atlas Mountains in Morocco and Algeria that receive rainfall. All countries should remain vigilant and undertake control operations whenever necessary. The Desert Locust situation began improving in late February on the Red Sea coast as infestations declined in some areas due to intensive control operations that treated 80 000 ha in February and because of drying conditions. 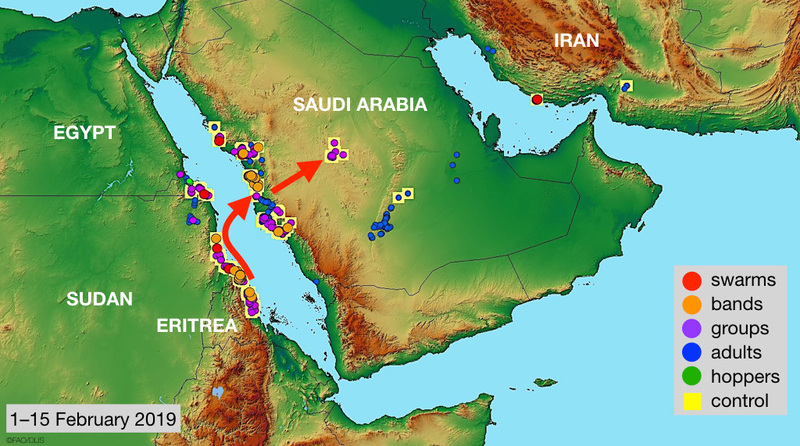 Control operations are still in progress against second-generation breeding along the Red Sea coast in Sudan, Egypt, Saudi Arabia and, to a lesser extent, Eritrea. There is a potential risk that any infestations that are not detected or could not be treated will form additional groups of hoppers and adults, bands and some small swarms as vegetation dries out further in March. Most of these populations are expected to migrate to spring breeding areas in the interior of Saudi Arabia while some could move to the Nile Valley in northern Sudan. As one generation of breeding is expected to occur in these areas between March and June, intensive monitoring and control efforts will be required by the affected countries. Breeding continues in eastern Yemen on the edge of the Empty Quarter in areas that received good rain from cyclones Mekunu and Luban in May and October respectively. From there, adults and at least one swarm have moved to cropping areas in Wadi Hadhramaut. As vegetation dries out in eastern Yemen, additional populations are expected to arrive in Hadhramaut and central interior areas, and breed if rains fall. In southwest Asia, control operations are in progress against adult groups and a few small swarms that were laying eggs along the southern coast of Iran in February. Breeding will continue, causing locust numbers to increase during the spring. The situation remains calm in West and Northwest Africa. Ground and aerial control operations are in progress as a result of a Desert Locust outbreak that developed on the Red Sea coast of Sudan and Eritrea during December. 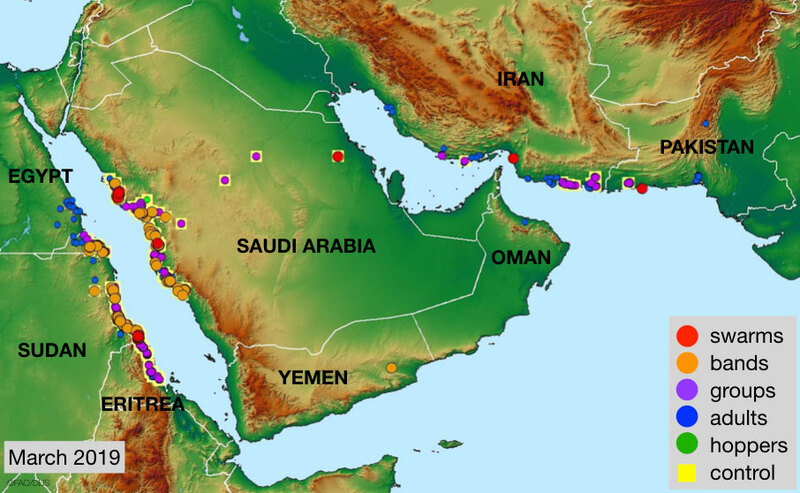 A second generation of breeding by adult groups and swarms continues in these areas as well as on the coast in southeast Egypt and on the central and northern coast is Saudi Arabia. Consequently, locust numbers are increasing along both sides of the Red Sea. In the past two weeks, there has been an escalation in second-generation hatching and hopper band formation on the north coast of Saudi Arabia between Thuwal and Masturah, on the central coast near Lith, on the southern coast of Sudan near the Eritrean border, and on the central coast of Eritrea. New swarms are likely to start forming at the end of the month in some places. In the interior of Saudi Arabia, groups of mature adults have reached the spring breeding areas between Zalim and Gassim where some of them have started to lay eggs. Immature adults are maturing along the western and northern edge of the Empty Quarter near Wadi Dawasir and southeast of Riyadh. Control operations have treated nearly 85 000 ha since December of which 30 000 ha were treated in the past two weeks in Egypt, Eritrea, Saudi Arabia and Sudan. Since the beginning of February, moderate rains have fallen on the northern Red Sea coast in Saudi Arabia between Yendo and Al Wajh while light showers fell on the central coast near Qunfidah. 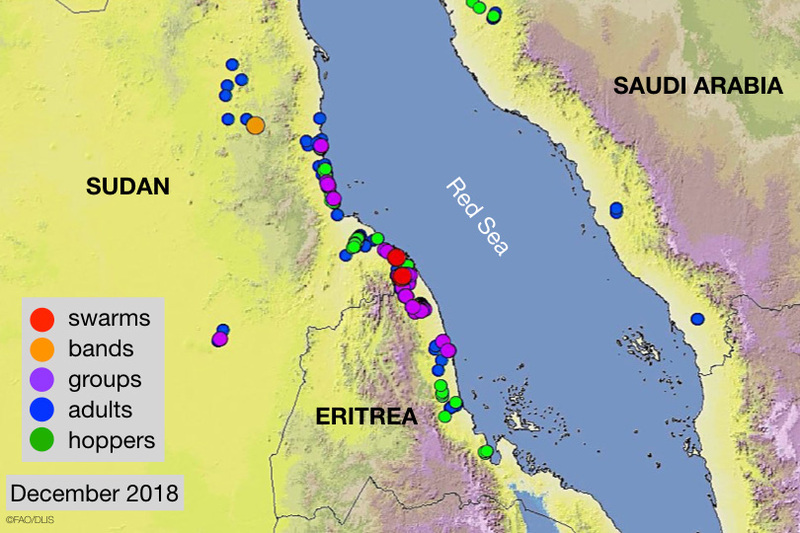 As vegetation is still green in coastal areas along both sides of the Red Sea, breeding will continue, causing a further increase in hopper and adult groups, bands and swarms. Once vegetation begins to dry out, adult groups and a few swarms are likely to move north along the Red Sea coast in Eritrea to Sudan, and from the Red Sea coast of Sudan to the Nile Valley in northern Sudan. There is a moderate risk that some swarms could cross the Red Sea to the coastal and interior areas of Saudi Arabia. All affected countries should step up vigilance and control measures to reduce current infestations and lessen the risk of migration and spring breeding. Survey and control efforts should be maintained in all areas. Favourable ecological conditions and extensive breeding caused a Desert Locust outbreak to develop in the winter breeding areas along the Red Sea coast in Sudan and Eritrea during December. Although breeding commenced in mid-October and continued throughout November, the extent of the breeding was not fully detected until December when widespread hatching occurred, groups of hoppers and adults began forming by mid-month, and adult groups moved back and forth across the Sudan/Eritrea border. By the end of December, a second generation of breeding had started as several mature swarms formed and laid eggs near the border. Ground teams treated 7,235 ha in Eritrea and 1,247 ha in Sudan during December. During the forecast period, first-generation hoppers and adults will form more groups and a few bands and swarms. This will be supplemented by second-generation hatching in January in both countries that will give rise to additional hopper groups and bands. Immature adult groups and small swarms could start to form by about mid-February. The extent of second-generation breeding will depend on rainfall and ecological conditions. 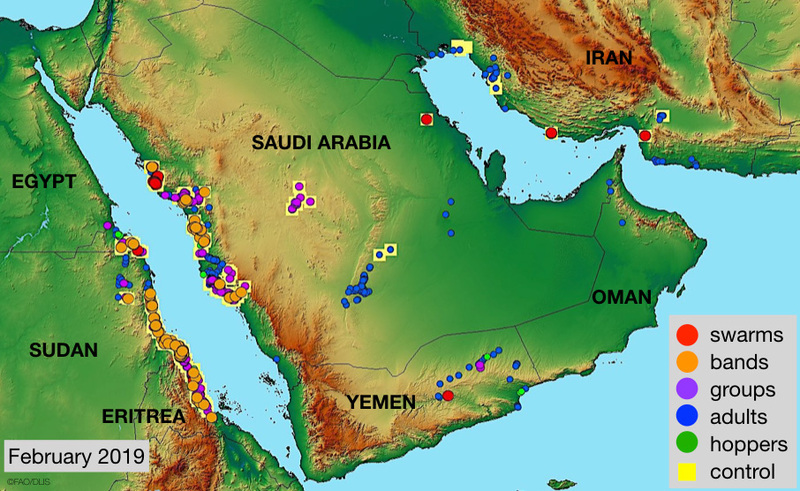 Elsewhere, small-scale breeding occurred in southeast Egypt, on the Red Sea coast in Saudi Arabia, and in southern Oman. A few small groups or swarms may form in the Empty Quarter near the Yemen/Oman/Saudi Arabia border where good rains fell from Cyclone Luban. So far, at least one small immature swarm has been reported in central Saudi Arabia south of Riyadh near Wadi Dawasir on 6 January 2019. Control operations were immediately undertaken. The situation remained calm in the other regions and no significant developments are likely.